Redbirds participate in paid and unpaid internships both on and off campus to explore careers, develop their skills and gain experience. Choosing a major, taking classes, and completing coursework are all steps towards one’s career. However, one of the best ways to get experience and learn the skills needed for a career is to participate in internships. In fact, according to a survey completed through the National Association of Colleges and Employers in 2018, those surveyed who completed at least one internship received a job offer more quickly and had a higher first-position salary than those who did not. An internship at the top of a resume can indicate to potential employers that the applicant has some experience working in a professional environment. This allows the candidate to discuss with employers the skills they developed and how they incorporated what they learned in their academics and applied it outside the classroom. “Employers know you will not be coming in with zero knowledge in the field and that you already possess a certain degree of professionalism and work ethic. An internship is a great way to jumpstart your career, and a big asset to include on your résumé upon completing your degree,” Career Center Internship Manager Debbie Ungson-Walbert said. Career Advisor Mark Fauble states that internships are very important for all majors and career interests. Haley Kosik ’18 received a job offer after completing an internship. 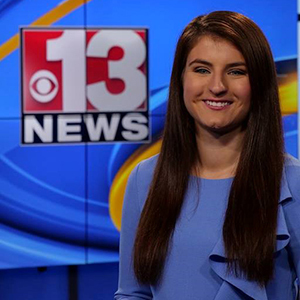 Her offer for a full-time multimedia journalist at WOWK-TV in West Virginia came just after completing an internship at an ABC News affiliate in Pennsylvania. Multi-media journalist and Redbird alum Haley Kosik ’18 at the anchor desk in West Virgina. Internships are a key way for Redbirds to develop and improve upon transferable skills. These skills that go beyond textbook knowledge are often learned in settings outside of the classroom. 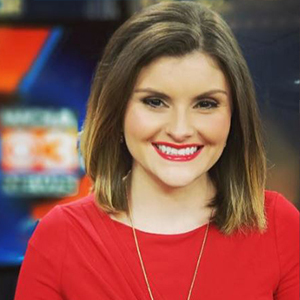 Hannah Zettl ’18 is a morning news reporter for KOZL-TV in Missouri and developed many transferable skills during her internship experiences at ABC News in Washington, DC; at a FOX Sports radio affiliate in Aurora; and even as a writing intern for the Career Center. “More than 75 percent of our graduating seniors have at least one internship for credit,” said School of Communication Assistant Professor Tom Lamonica. Illinois State University has many opportunities for journalism students to intern without ever having to leave campus. 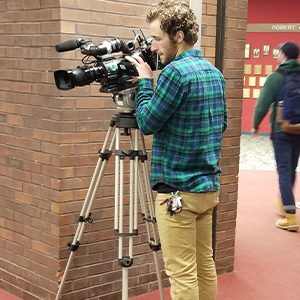 For example, the School of Communication offers internships with a variety of campus outlets including TV-10 News, The Vidette, and radio stations WZND and WGLT. “I always felt that Illinois State prepared me in ways that no other university could have. I can only thank the University for the numerous Leadership Opportunities and endless possibilities,” said School of Communication alum Alex Corradetti ‘14. Champaign morning show news anchor and Redbird alum Alex Corradetti ’14. 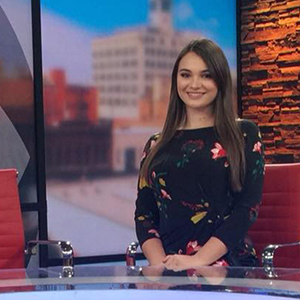 In addition to Corradetti’s internship with TV-10, she also interned at RockitRanch Productions and has gone on to become a morning news anchor and producer at WCIA-TV in Champaign. Internships are not difficult to find. Students can identify internship positions using Hire-A-Redbird, Illinois States online job vacancy system, or meet with their career advisor. Redbirds also have the opportunity to explore internship options at the Spring Internship Fair on February 19 at the Bone Student Center. Recruiters from over 50 organizations from varying industries will be seeking Redbird talent from all majors to discuss internship opportunities. The Career Center assists students with developing, evaluating and/or implementing career, education and employment decisions. The program also supports Illinois State University’s Educate Connect Elevate: Illinois State—The Strategic Plan for Illinois’ First Public University 2018-2023.